Koch’s bluntness likely closed the door to a potential governorship, despite his popularity among urban constituents. 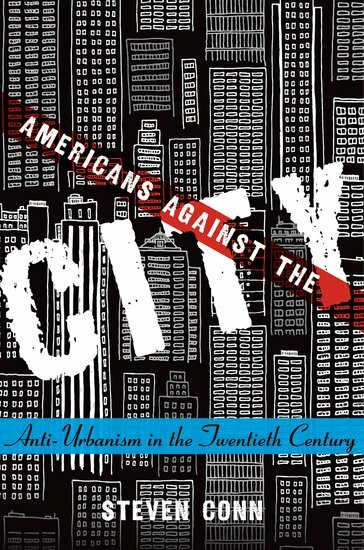 During Koch’s long tenure as mayor (1978-1989) most Americans harbored distinctly anti-urban attitudes, preferring the serenity and monotony of suburban life over the clamor and chaos of the “greatest city in the world.” In fact, as Stephen Conn argues in Americans Against the City, the story of American anti-urbanism—a generalized distaste for the dirt, diversity, and disarray of the city—stretches across the nation’s history. According to Conn, since the end of the Civil War, the American political and physical landscapes have been deeply interrelated. Where and how we live shapes our political attitudes and expectations. Focusing on the material, social, and cultural elements of living habits inside and outside the city, Conn argues that the anti-urban strain in American culture—manifest in the growth of suburbs and decentralized cities—relates directly to a mistrust of centralized government. 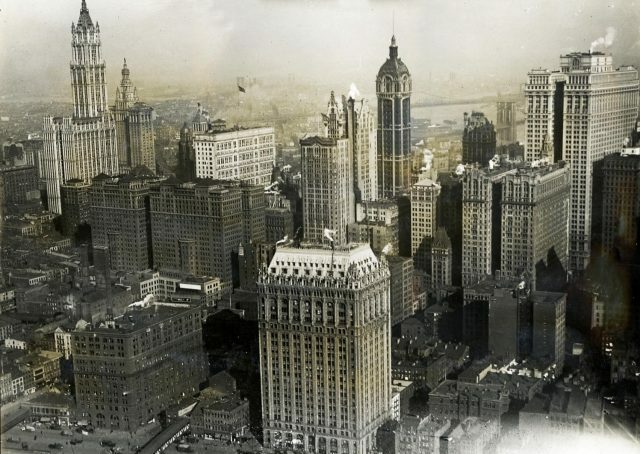 Progressives in the 1920s saw the dense cities of the Northeast as workshops where the problems of governance could be perfected. Yet by the end of the Second World War, that optimism had faded. Cold Warriors and their successors on both ends of the political spectrum tried to reclaim their independence from big government by rejecting urban life. Conn links the decline of “urbanity” (a sense of collective responsibility and tolerance) in modern politics to this national decentralization—the “hustle and bustle” of a true city provides “lessons in civility and diversity” that once enriched our political process. As Americans fled to suburbs, urbanity—and civility—plummeted. New York City in 1919 epitomized the benefits and problems of urban life (via Wikimedia Commons). Beginning with Frederick Jackson Turner (whose 1893 essay “The Significance of the Frontier in American History,” Conn describes as “a Mid-Westerner’s revenge on…an overbearing East Coast.”), Americans have been skeptical of cities. Conn examines how a sense of exceptionalism convinced many Southerners and Westerners in the late 19th century that urban centers like New York City and Chicago posed a threat to American values, like ruggedness, self-sufficiency, and independence. Furthermore, city-dwellers at the turn of the century faced real problems, such as unsanitary living conditions, corrupt political machines, and overcrowding. Yet the solutions that urban-skeptical reformers offered didn’t address these issues; instead, most of these projects aimed to push people out of cities. The problems of the city, according to people like Benton MacKaye, arose from the density and variation of urban life and would not follow Americans into nature. MacKay designed the Appalachian Trail, the 2,200-mile hiking trail extending from Maine to Georgia, in 1921 in the hopes that city-dwellers would follow it out of the urbanized Northeast and, after finding a more wholesome existence, never return. 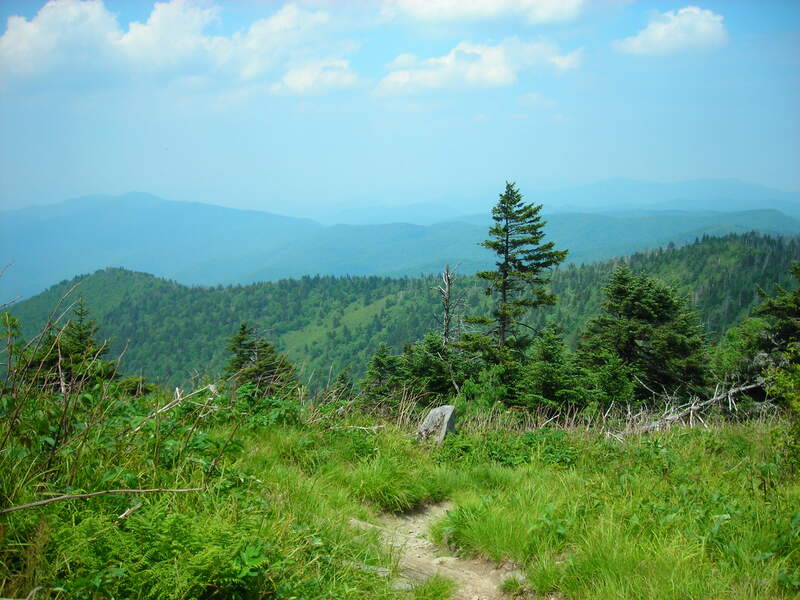 The Appalachian Trail (via Wikimedia Commons). As suburbs proliferated across the nation, Conn argues, they sustained “decentralized cities,” where whites and other privileged groups left urban centers at the end of the work day and returned to homogenous housing developments. “Most suburbs,” Conn explains, rather than developing a unique culture, “functioned to reject the city while simultaneously taking advantage of it.” Decentralized cities like Albuquerque, NM relied on federal government spending for growth, largely for maintaining and constructing roads, despite the anti-government attitudes of their citizens. Other decentralized cities in the Midwest, like Columbus, OH, embarked on “urban renewal” schemes in which the living history of the city fell victim to commercial development. In 1979, city leaders demolished Columbus’s historic train station to make way for a convention center and parking lot. “Beyond expressing their contempt for trains,” Conn argues, “those who ordered the building torn down expressed their contempt for Columbus’s past.” Dismissing the benefits of city dwelling, and the importance of a city’s history, anti-urban sentiments poisoned most urban renewal schemes of the late 19th century. This 1987 mural by Gregory Ackers depicts Columbus’ historic Union Station. 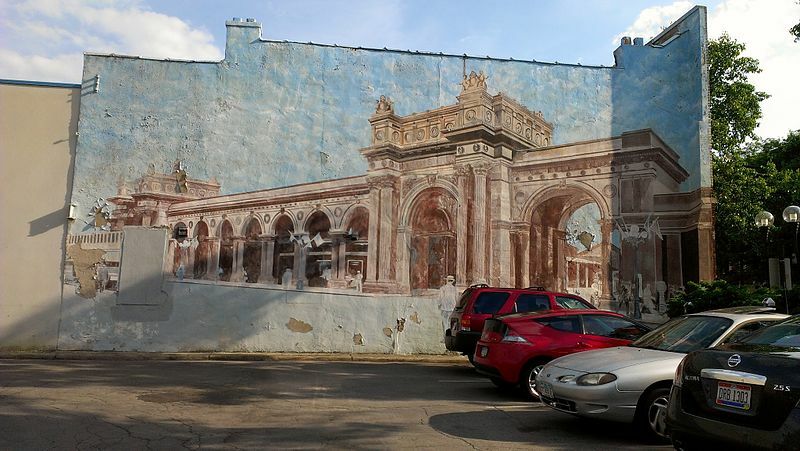 In 2014, new construction on the lot blocked the mural from public view (via Wikimedia Commons). Houston also serves as an example of how modern “gated communities” attempt–and fail–to cultivate the vibrant urbanity lacking in decentralized cities. Communities, Conn demonstrates, are just as much about exclusion as inclusion, and the gated oases of suburbia represent “exactly the opposite of city life.” The gated communities suggest “a society where social ties have frayed, where we simply do not trust each other and do not even want to make the attempt.” That exclusion—in Houston, as in Greenwich, CT—often follows racial and socioeconomic lines. 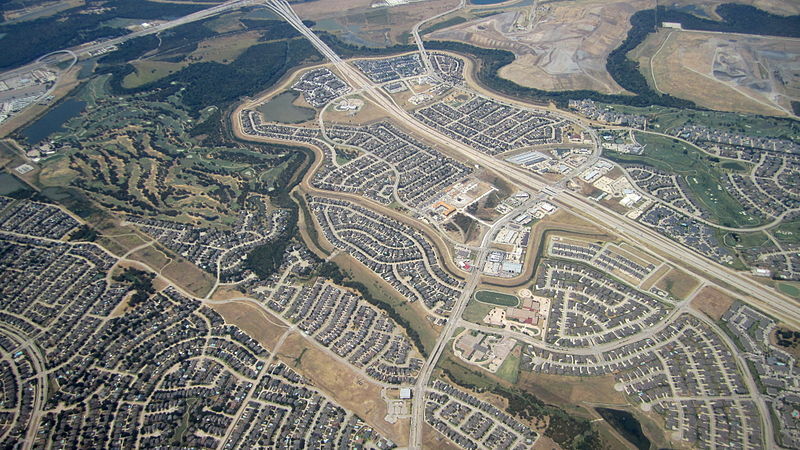 Sprawling suburbs, like Indian Creek outside of Dallas, characterize many cities of the American Southwest (via Wikimedia Commons). 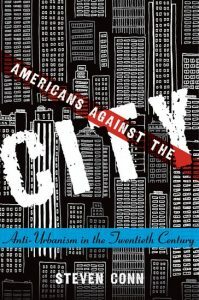 Americans Against The City stands as a well-researched and provocative history of the ideas and politics rooted in our physical environment. Conn’s easy writing style and fascinating evidence make the book a pleasure to read. His conclusions resonate with the contemporary moment and offer a new explanation for the fraying political consensus. Suburbs, Conn explains, disconnect us from our geography–disassociating our work lives from our personal lives, our futures from our histories. As a result, although Americans are more mobile than ever, we feel detached from our political geography. This disruption lies at the heart of a creeping polarization in our political discourse, canceling out opportunities for compromise and eroding a sense of collective responsibility. The values of democratic government, Conn reminds us, arose from urban milieux. It remains to be seen whether they will survive in the suburbs.